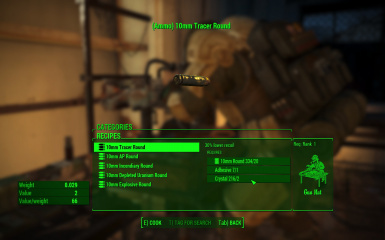 A simple and modular patch to adapt the mod Loads of Ammo by TheTalkieToaster to the survival mode in FO4. Loads of Ammo, created by TheTalkieToaster. This mod is a simple and modular set of tweaks, attempting to adapt the mod Loads of Ammo by TheTalkieToaster to the survival mode in Fallout 4. Add weight to all ammo types added in Loads of Ammo. Make crafting a bit harder. Adhesive is now required for all the recipes. I had to make these changes myself for my Survival game and I figured I might as well put it up here, since it seems like there has been some need for it. The intent is to make the content of Loads of Ammo more well-integrated with a hard, Survival game. Ammo weight means that you need to consider more carefully what to bring with you and recipes requiring adhesive should lead to it being a bit harder and more frustrating to acquire these new specialized types of ammo throughout the game. I found other things in Loads of Ammo to work well with a Survival game. The perk requirements for crafting the new ammo are well balanced I think. TheTalkieToaster for putting all the effort into the wonderful mod Loads of Ammo! For each ammo category, use the vanilla survival weight for all of the added ammo types in that category. For each ammo category except missiles and mini nukes, use 120% of the vanilla survival weight for all of the added ammo types in that category. The reasoning behind this being that resources are used in creating these new kinds of ammo, so it makes sense that they should weigh a bit more. New missiles and mini nukes have individual weights for each ammo type (see the details below). Versions supporting Valdacil's Item Sorting (VIS) is there for both options. Notice that for the VIS versions, I renamed "Alpha Round" and "Beta Round" into "Gamma Alpha Round" and "Gamma Beta Round", in order to keep all of these kind of ammo sorted together in the inventory. All new regular ammo, whether it's 10mm, fusion cells, flamer fuel or rail spikes, now require 1 adhesive to be crafted, along with the other resources. I believe all new ammo, with a few exceptions, should require the same amount of base ammo as is produced to be crafted. This meant that I needed to change the recipe for 20mm Electromagnetic Capacitor Shock to also include 10 2mm Electromagnetic Cartridge. All new cannon ammo now require 2 adhesive to be crafted, along with the other resources. Artillery flares, Vertibird BoS flares and synth flares now each require 1 adhesive to be crafted. All new missiles now require 3 adhesive to be crafted, along with the other resources. Frag flares, pulse flares and plasma flares already require adhesive, so these have not been touched at all. Mini Nuke Dirty, Mini Nuke High-Yield and Mininuke Mine / Minefield Canister now all require 6 adhesive to be crafted, along with the other resources. Adhesive is added since it is the single hardest resource to obtain and adding it to all the recipes should force the player to have to consider carefully which ammo to craft.